Hamas sets preconditions for prisoner swap with Israel, promises to force Israel to release convicted terrorists. 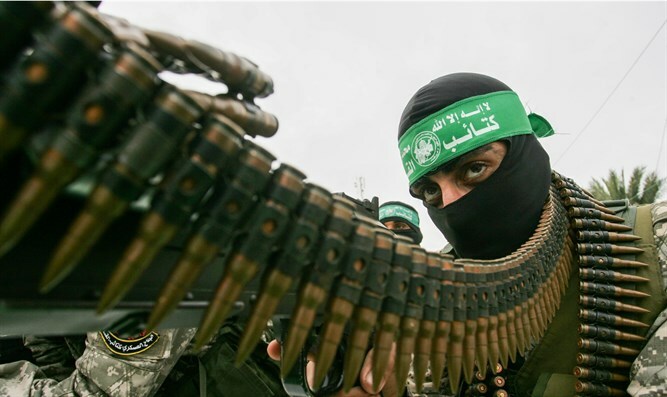 The Hamas terror organization insists Israel release all of its terrorists and follow the Geneva Conventions during the time the terrorists are in prison. Hamas does not follow the Geneva Conventions. In a statement, Hamas promised to redouble its efforts to release all terrorists via an "honorable deal." As a precondition to a prisoner swap, Hamas insisted Israel release all "Shalit deal" terrorists who were re-arrested due to renewed involvement in terror activities. IDF soldier Gilad Shalit was captured in 2006 in a Hamas attack. He was released in 2011, in exchange for over 1,000 convicted terrorists. Since then, Hamas has promised and carried out additional kidnappings, in efforts to replicate a similar deal. Hamas demanded Egypt, which has served as a go-between on the issue, press Israel to release the Shalit deal terrorists. They also requested that the Red Cross press Israel to implement the Geneva Conventions. Turning to the imprisoned terrorists, Hamas said, "Our enemy does not understand anything but the language of force," promising to do everything in its power to force Israel to release them. Hamas currently holds the bodies of two IDF soldiers, as well as two Israelis presumed to still be alive. In August 2014, IDF soldiers Hadar Goldin and Oron Shaul were killed during fighting with the Hamas terror organization. Their bodies were both taken into captivity by Hamas terrorists in the Gaza Strip, and have been held there since. In addition, two Israeli civilians, Avera Mengistu and Hisham al-Sayed, went missing in Gaza. They are believed to suffer from mental illness. In July 2017, the Red Cross ordered Hamas to clarify the fates of Mengistu and al-Sayed. Hamas, however, ignored the demand.